Chances are you have heard of the band Nine Inch Nails and we were happy to welcome some of the boys associated with that group aboard today to try their hand at some Ft. Lauderdale fishing. This trip was a six hour charter and we began at 7 AM. Comfortable sea conditions of about two feet today as Capt. Chris made his way to the outside edge of the third reef and Mitch put out the spread and was ready for action at the one mile marker out in front of our inlet. Partly cloudy skies and a slight onshore wind of maybe 5 MPH. Current was northerly at about one knot with blue water right up tight on the reef. 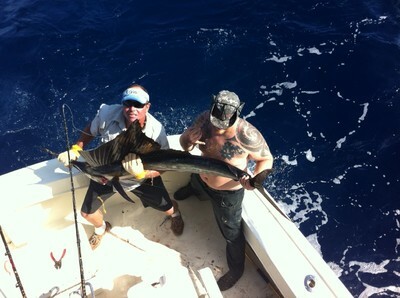 The fish of the day was this nice Sailfish which took a Goggle Eye baitfish fished from one of our kites. We will continue to try to locate good areas offshore by trolling our typical fall spread of planers and deep lines but will often switch to the live baits when we see favorable conditions or evidence of schools of bait or predators. Around the third week of November we will (if the typical 10 day to two week push of Sails arrive) be live baiting much more. Right now we will continue to troll quite a bit to try to fill the gaps in the action with assorted species. The fishing will remain erratic until those Sails arrive. This trolling just off the edge will produce some good Wahoo and scattered Kings.